The past weekend we visited Aarhus in Denmark and the danish doll convention DollConDK run by Danske BJD Entusiaster. We had a wonderful time. The market area was filled with wonderful things and the exhibition was very impressive. The hole place was dripping with talent and packed with friendly people. We had our own talble in the market area, selling a few things. Here you see JennyM attending the table. The doll on the left is the one that won the prize. She is an Iplehouse Tania dressed in a traditional oufit from c:a 1900 from the region in Sweden that I’m from. A big thank you to everyone involved with this convention and a big Hello to everyone I met there! 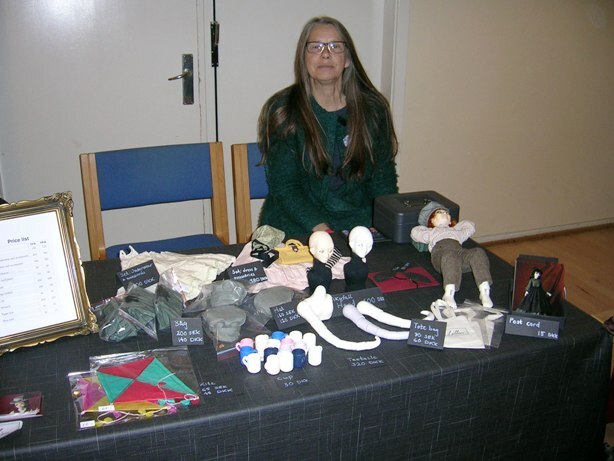 Margaretha from Margarethas Dockskåp held her annual teddy fair last Sunday in Kosta, Sweden. There was a lot of teddy bears and other stuffed toys of different kinds, a lot of miniatures, a few dolls and much more. We had a table, selling doll parts and accessories. It was so nice to meet all the talented people. The big Teddy company Steiff from Germany arrived with a human sized teddy costume. The bear really created a good atmosphere. 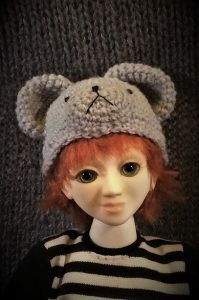 Basil was wearing a new teddy bear hat for the occasion. We are back from the convention Jointed Hearts in Gothenburg. It was, once again, a very stimulating weekend with a lot of talented, nice and interesting people, competitions, workshops and dolls!!!!. Basil, in the shape of a lazy farmhand, took a rest on our merchant table where you also can see some of the recently casted jointed tentacles. I have been working on something of a side project. 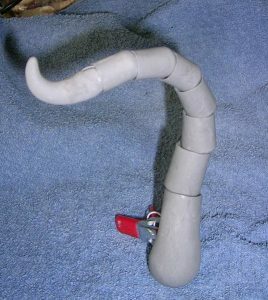 It’s an optional arm part for the Basil body, in the shape of a fully jointed tentacle. This part will fit any similar socket, so it should be compatible with a wide range of dolls. I plan to cast it in house and sell it through my etsy shop. That’s all for now, take care and doll on. Author LillithPosted on July 31, 2018 July 31, 2018 Categories sculpting and castingTags Basil, original sculpt, partsLeave a comment on A Squiggly Thing! Things have been quiet here for a while and there is a reason for that. I have bought a house! While it’s not going to be time to move in for some time yet, this will cause my doll hobby to be forced to take the back seat for a while. The good news for my doll making is; that I will be able to set up a much better work space and hopefully some equipment for better casting in the future. It will also mean that I am far less restricted to what hours of the day I can work without disturbing my neighbors, and that’s always a plus. So, how far has the Basil project come so far? Well, I have made a rough cast in polyurethane and while he is far from perfect, this has made it possible to work out the flaws that he has. The later is what will then be used as a master for the final molds. I will likely use a casting service for this as I suspect it will take some time before I have good casting facilities set up at the new place and I can’t hope to get a professional result with what I currently have. Author LillithPosted on March 25, 2018 Categories UncategorizedLeave a comment on I’m moving! These measurements are taken from the home cast Basil prototype. Please note that the measurements may differ slightly on the final version of the body, this is just to give you an idea of the size and proportions. Here you see the Skyfall head on a Souldoll Kid in NS with the small bust option. This time the head is one of the professionally cast ones and the color is also NS. The match is not perfect, but close enough that a bit on cleaver blushing can compensate. The fit, proportions and posing is good. The 22nd of October the annual teddy fair is held in Kosta, Sweden. The fair is organized by Margarethas Dockskåp. This store sells many different types of dolls, toys and miniatures. 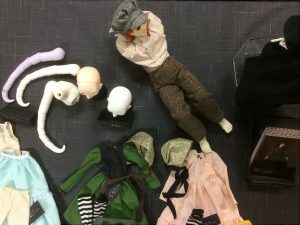 Among other things they have a large selection of wigs and eyes suitable for BJD and a huge selection of doll house miniatures that fits 1:12 scale dolls. We have not attended this particular event before, but we have been to other events arranged by the same store. 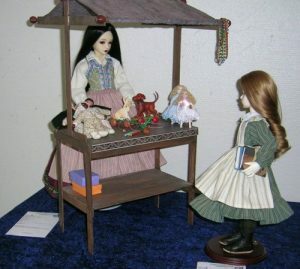 While the main focus of the fair is teddy bears and other stuffed toys; dolls, doll house miniatures and other miniature and craft related things are also welcome. We will be there with more or less the same stuff we brought to Jointed Hearts. This means the Skyfall head will be available for purchase as well as various clothes and accessories. We will also bring the Basil body prototype. Feel free to handle him a bit, ask questions and tell us what you think. We’d love to get some feedback. If you visit the fair, please come by and say hello! We are fresh home from this years edition of Jointed Hearts, a BJD convention held annually in Gothenburg, Sweden. While a bit on the small side, it was still packed with interesting people and an astonishing amount of skills and talent. There were several doll artists present and many other lovely crafts as well. The theme of this years exhibition was “the Machine” and it was so much fun to see the many interpretations. The most impressive one being a working arcade machine in 1:3 scale! Way beyond awesome. I managed to make a rough cast version of the Basil body done in time to take with me and I had him displayed on our table with a note encouraging people to pick him up and examine him closer and many did. I learned so much out of the amazing feedback that people gave and also a lot from just watching how people handled him and what they looked for first. A big thank you to all who did! I also had the great fortune to be able to get some feedback from more experienced artists and a chance to nerd a bit about casting and sculpting materials. Now I will take a couple of days to wind down and rest up a bit, then it’s time to do a bunch of minor fixes to Basil and to make him ready to be professionally cast. With a bit of luck I will be able to open the first preorder for him later this fall. Meet Basil, a body I have made to fit the Skyfall head. 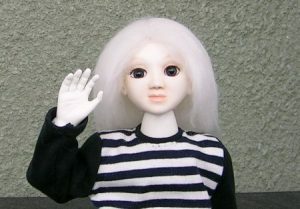 He is about 41cm tall with the head and that puts him in the shorter range of the 1/4 dolls. I am almost finished with the original sculpt. The plan now is to cast a prototype in house and hopefully have it finished enough to bring it with me to Jointed Hearts. To give an idea of his size and proportions, here he is posed next to a Doll Leaves Wish.